I know this should have been done two days ago, but . . .well. . .Life gets in the way sometimes. The fabulous Heather Powers of Humblebeads was inspired to create a Flickr group that she's calling Bead Table Wednesday. Each Wednesday, members will snap a photo of what's on their bead table(s) to share with the group (or anyone else who just wants to get an eye-full of the beady goodness that's going down over there.) Many are also sharing these photos on their blogs. Since I was a little manic on Wednesday, I didn't get my Bead Table Wednesday picture taken until Thursday morning, but I promise nothing had been touched from the previous day. It's nothing spectacular for my first submission to the group, but it is what it is. You can see my bag of goodies from SueBeads in in the upper right corner. Across the bottom is a work in progress. It's a conglomeration of beads and other bits. I'm still trying to decide if I like it or not. So that's it. 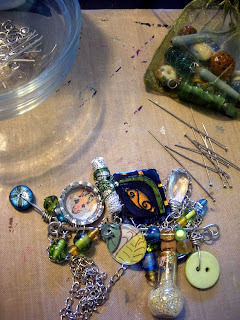 You can check out Heather's original post about Bead Table Wednesday on the Humblebeads Blog. And don't forget to enter my Earring Holder Display Giveaway! Howdy partner! I'm still trying to catch up to Bead Table Wednesday! Eek!!! Ha! You see that I was running behind too. . .